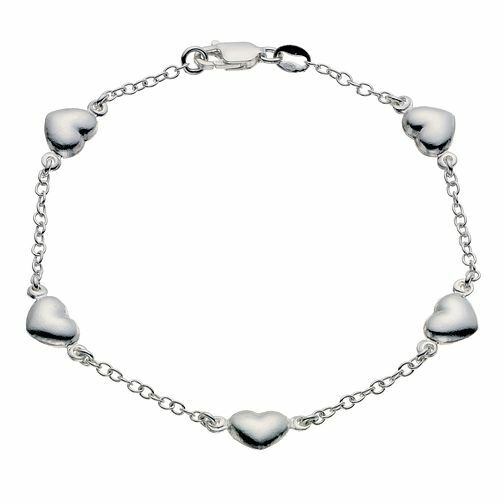 Silver station bracelet featuring five heart detail. A great girlie gift for a friend or a treat for yourself. Silver Heart Station Bracelet is rated 3.4 out of 5 by 5. Rated 5 out of 5 by Anonymous from Nice pretty bracelet This bracelet is a pretty bracelet, quite delicate and very quite fabulous!!! Rated 1 out of 5 by Anonymous from Not good Looks pretty. Good value. Could not close the clasp by myself. Very fiddly and stiff. Couldn't even put on with help. Would not recommend.